App monitoring helps you with mobile app promotion. You always know how users react, how they rate the app and what your competitors are doing. 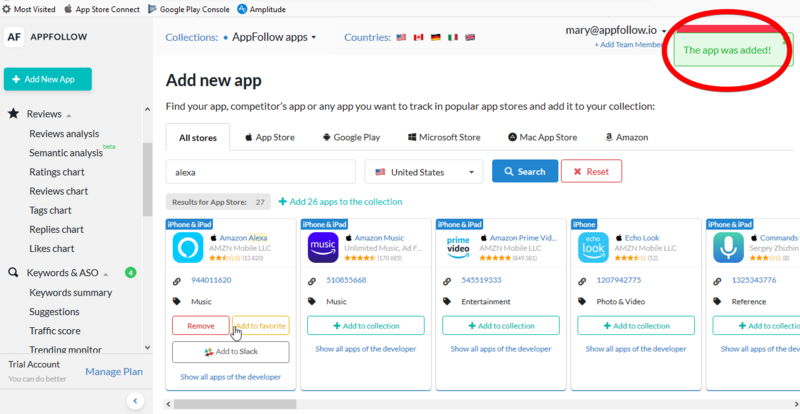 To start monitoring apps, add them to your AppFollow account. We support App Store, Google Play, Amazon Appstore, Microsoft Store and Mac App Store. 4. You will see a sign "The app was added!". After that we will upload all data about it from the app store. All your collections will be available in a drop-down menu. Type the name of the collection in a search box. 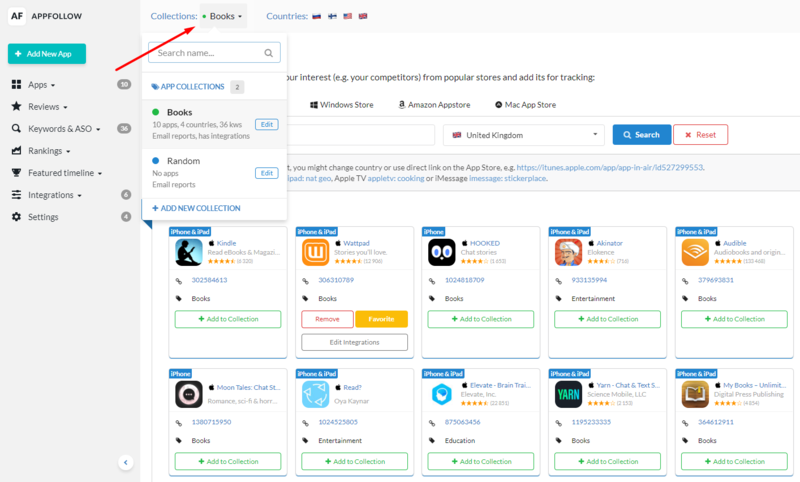 If you need to track the same app in several collections, you need to add them separately to each collection. You can add any item and product from Amazon to monitor their rating, reviews, and sales. 5. You will see a sign "The app was added!". After that we will upload all data about it from the URL app store. If you couldn't find an app using search, you can add it using its URL. 1. Find the app you want to track in the app store and copy its link. 2. Go to AppFollow account and click the green button + Add New App on the left. 3. Paste the app link into the search box and click "Search". 4. Click "+ Add to Collection" to start gathering app data. Sometimes you can't find an app by typing its name. It can be that the app you’re looking for has not been launched yet or is limited to few countries or regions. Try another country or language. Keep in mind that AppFollow has its own search algorithms. It means the subsequence of search results will be different from what you may see on your iPhone, Android or Windows device. Need help? Just hit the red Intercom button, we're here for you!